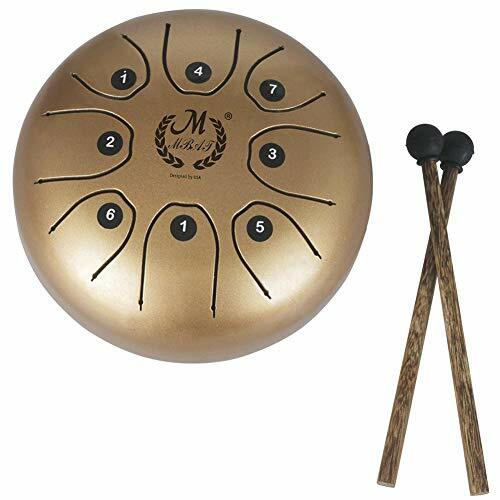 IMSHIE Steel Tongue Drum Tank Drum Chakra Dru 5.5 Inch Mini Musical Mallets Handpan Brahma Drum by IMSHIE at Bass Brass. MPN: IMSHIE -77. Hurry! Limited time offer. Offer valid only while supplies last. The happy drum is a collection of Chinese millennial philosophy, religion, culture, art, music, and Chinese studies. It combines modern craftsmanship, sound theory, and innovative design. It is a work of art, a musical instrument, and even your soul mate. The surface is designed with water-based environmentally friendly paint which is pollution-free and does not fade. It is in the shape of a pebbles and its voice sounds ethereal. It is hand-built and artificially tuned, and the tone is accurate and sound is ethereal. ღ The surface is designed with water-based environmentally friendly paint which is pollution-free and does not fade. ღ It is in the shape of a pebbles and its voice sounds ethereal. It is hand-built and artificially tuned, and the tone is accurate. ღ The happy drum is a collection of Chinese millennial philosophy, religion, culture, art, music, and Chinese studies. ღ It combines modern craftsmanship, sound theory, and innovative design. It is a work of art, a musical instrument, and even your soul mate. ღ It has such a cool, unique, relaxing, chill-out sound. After a long day at the office, it is perfect for decompression. Suitable for personal meditation, yoga, Zen, sound therapy. If you have any questions about this product by IMSHIE, contact us by completing and submitting the form below. If you are looking for a specif part number, please include it with your message.